This policy brief is one of five commissioned by the Department of Health and Human Services, Office of the Assistant Secretary for Planning and Evaluation on Medicaid eligibility policies for long-term care benefits. 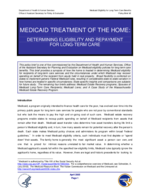 This brief provides a synopsis of how the home is treated in determining Medicaid eligibility for recipients of long-term care services and the circumstances under which Medicaid may recover spending on behalf of the recipient from equity held in real property. Broad flexibility is conferred on states to implement generic Federal Medicaid rules, resulting in considerable state-to-state variation in how homes are treated in specific circumstances. State-specific insights and comparisons are subjects for future study. The remaining four briefs address: Medicaid Estate Recovery programs; Spouses of Medicaid Long-Term Care Recipients; Medicaid Liens; and A Case Study of the Massachusetts Medicaid Estate Recovery Program. Medicaid, a program originally intended to finance health care for the poor, has evolved over time into the primary public payer for long-term care services for people who are not poor by conventional standards but who lack the means to pay the high and on-going cost of such care. Medicaid estate recovery programs enable states to recoup public spending on behalf of Medicaid recipients from assets that remain after their death. Medicaid asset transfer rules determine how asset transfers during life limit a persons Medicaid eligibility and, in turn, how many assets remain for potential recovery after the persons death. Each state makes Medicaid policy choices and administers its program within broad Federal guidelines.1 In order to meet Medicaid eligibility criteria, such individuals must first deplete or spend down their assets. The family home is generally the most significant asset a person can own, and one that is prized for intrinsic reasons unrelated to fair market value. In determining whether a Medicaid applicants assets fall within the specified low eligibility limits, Medicaid rules typically ignore the applicants home, regardless of its value. However, there are legal and historic precedents for looking to home equity to recoup Medicaid spending on behalf of the recipient at some future date when the home is no longer needed by the recipient or certain close relatives. The home is an excluded resource in determining Medicaid eligibility, regardless of its value. Medicaid policies protect the home for the use of recipients and certain close relatives. Using home equity: When the house is no longer a "home" and becomes a countable asset, Medicaid may require its equity to be spent on the homeowner's healthcare costs. A lien may be imposed on the home to ensure this outcome. The homeowner may also lose his or her Medicaid eligibility, at least temporarily. State variations: Treatment of the home in specific cases varies from state to state. Each state has flexibility, within broad Federal guidelines, to determine its own policies and procedures for viewing the home as a countable or exempt asset. As long as it serves as the principal place of residence of a Medicaid recipient (and/or spouse, if any, and/or certain close relatives), the home is not factored into the Medicaid eligibility determination, regardless of its value.2 This exclusion has a dual purpose. It spares state agency staff the difficult and time-consuming work of assessing the value of the property, and it ensures that applicants are never denied assistance with basic life necessities because they own a home. The fact that the Medicaid program generally serves people with very low incomes means that the typical recipient cannot afford to own valuable real estate. However, recipients in nursing homes are not typical of the Medicaid population in general. They may qualify for Medicaid despite having incomes far above the poverty level, which may have enabled them to accumulate significant equity in a home. The criteria used by states to determine whether a home is the principal place of residence vary considerably.3 The home of a Medicaid recipient must be regarded as an exempt asset when the individual (or his or her spouse or dependent relative)4 actually lives there, or in periods of temporary absence during which the individual intends to return home. The likelihood that the home of an unmarried Medicaid recipient will become a countable asset when he or she is admitted to a nursing home or other medical institution depends on: 1) whether the recipient intends to return home, and 2) how the Medicaid policies of the recipients state view that intent. The recipients intent to return protects the home. Lack of intent converts the home into a countable asset, which may, in turn, cause ineligibility for Medicaid assistance. Federal Medicaid guidelines instruct states to use the same subjective test of intent to return that is used by the Supplemental Security Income program (SSI).5 A home is not counted as an available asset in determining Medicaid eligibility as long as the recipient expresses an intent to return home from a nursing home or medical institution, regardless of how long he or she has been institutionalized or whether there is any reasonable expectation that the individual could possibly return home.6 This totally subjective intent may be expressed in a letter or affidavit signed by the homeowner. There need not be any reasonable expectation that the person will ever be discharged to return home or consideration of the persons health, functional status, or length of stay in the nursing home.7 What happens when the recipient cannot clearly state his or her intentions due to physical or mental incapacities? Federal guidance allows relatives or others to make a statement of intent on the individuals behalf. How states apply these vague guidelines in individual cases deserves further study, particularly when statements of intent to return are made by persons other than the recipient who have a personal interest in preserving the home and its equity. While most states follow SSI rules and accept the individuals subjective statement of intent to return, others use objective criteria to determine when the home loses its protected status. The so called 209(b) states8 can opt to use more restrictive criteria that disregard the individuals intent, such as the assessment by a physician or other treatment professional of the likelihood that the institutionalized individual will be discharged to return home. Alternatively, 209(b) states may presume that a permanent change of residence has occurred after an extended period of residence in an institution when there is no reasonable expectation that the recipient will return home, regardless of his or her intent.9 In all states, once real estate owned by the recipient is no longer considered to be the home, its equity is then presumed to be available to reimburse Medicaid for costs paid on his or her behalf, like any other countable asset. States may also impose TEFRA liens on homes (described below), which are conditional on determining the person to be permanently institutionalized. States are permitted to use objective criteria to make this determination. How individual cases are resolved when the States determination that a recipient is permanently institutionalized for purposes of a TEFRA lien conflicts with the recipients professed intention to return home has not been studied. As is the case for many people who pay for nursing home care out of pocket, circumstances may force Medicaid recipients of long-term care services to sell their homes. Although rules determining the recipients share of long-term care costs allow income to be set aside for home maintenance expenses for a period of time, the amount of these allowances may be limited at state option. Sooner or later, recipients may not have sufficient funds to pay property taxes, insurance, or other expenses necessary to maintain their homes after spending most of their income to meet Medicaids monthly share-of-cost payments for long-term term care.10 In this scenario, selling may be their only viable option. However, once the home is sold, its equity interest, based on the propertys fair market value and net sale proceeds, becomes a countable asset. In a similar fashion, the home of an institutionalized Medicaid recipient loses its exempt status once he or she no longer intends to return home, and the homeowners equity interest becomes a countable asset. The value of that equity interest will, no doubt, exceed the low Medicaid assets limitations, and the recipient will no longer qualify for Medicaid assistance. This leaves the home owner no choice but to sell the home and use the net proceeds to pay his or her long-term care costs. Also, although the home generally remains an exempt asset while the Medicaid recipient is still living, it becomes a countable, or recoverable, asset after the recipient dies. In other words, states have the right to recoup Medicaid-financed long-term care costs incurred on behalf of the recipient from the equity interest in the individual's home upon death, along with any other assets in the estate. States recoup these costs through the administrative vehicle of estate recovery programs. In these cases, the recipients heirs must pay off Medicaids claim in order to receive a clear title to the property. Heirs who lack the means to settle the Medicaid claim may either obtain a loan or mortgage to keep the home in the family or sell the property and use proceeds of the sale to reimburse Medicaid for expenses paid on behalf of the recipient. Once again, little data is available about how many people choose this option or what types of state-sponsored assistance are available to them. Generally speaking, Medicaid treats the transfer of title to a recipients home like the transfer of any other valuable asset. If a recipient disposes of assets for less than their fair market value, he or she may be penalized by becoming ineligible for Medicaid long-term care assistance for a period of time. If the person transfers assets within a specified period (the so-called look-back period is 36 or, in the case of transfers to a trust, 60 months) prior to applying for Medicaid long-term care, denial of coverage will begin at the time the transfer was made and will last for as long as the uncompensated value of the gift would have covered the private-pay cost of nursing home care.11 Transfers of assets prior to the look back date are not penalized. In some cases, the transfer of title to a home does not incur a Medicaid penalty. Medicaid recipients can transfer sole ownership of their homes to their spouses without penalty. The spouse is then free to do as he or she wishes with the property without adversely affecting provision of Medicaid long-term care services to the recipient. Recipients can also transfer their homes without penalty to: a child who is under age 21 or blind or permanently disabled (at any age); a sibling who has an equity interest in the home and was residing there for at least 1 year prior to the applicant's need for long-term care; or a child of any age who was residing in the home at least 2 years prior to the applicants need for long-term care and who provided care that permitted the applicant to reside at home rather than in an institution. Gifting the home or transferring it for a fraction of its market value to non-disabled adult children or other relatives may be a widespread and socially accepted practice, but it carries the risk of losing Medicaid long-term care coverage if it is done for the purpose of satisfying Medicaid financial eligibility criteria. The possibility exists, however, that the State may waive the Medicaid penalty for such transfers in cases where withholding Medicaid coverage from the former homeowner would cause undue hardship -- for example, if the family member to whom the home was transferred refuses to help pay nursing home costs during the penalty period and if, as a result, no nursing home is willing to care for the former homeowner. Because home equity conversion is a relatively new and evolving phenomenon, there is a very real potential for confusion; misunderstanding or misapplication of the rules; or legal uncertainty when the home conversion involves a contract or other legal instrument.17 While home equity conversion may be a useful tool for long-range estate planning, Medicaid rules that penalize uncompensated asset transfers anticipate situations where conversions serve, by design or accident, to help the homeowner avoid paying long-term care expenses, while preserving home equity for the homeowners heirs. Given the wide variety of possible financial mechanisms and legal ramifications, it remains to be seen how successfully states apply Medicaid asset transfer rules to home conversions. Passage of the Tax Equity and Fiscal Responsibility Act (TEFRA 1982) gave states the option of placing a so-called TEFRA lien18 -- an encumbrance filed against real property in the local land recording office (often called the Registrar of Deeds) -- on the home of a permanently institutionalized Medicaid recipient in which he or she no longer resides. A TEFRA lien does not interfere with the homeowners use of the property, although it does prevent him or her from transferring the home as a gift to non-disabled adult children or other persons before the State has an opportunity to file a claim against it. Any attempt to transfer title of the property to anyone other than the spouse is presumed to signal that the house is no longer the home of the still living recipient. Recoveries made through successful claims reduce Medicaids share of the recipients total long-term care expenses.19 The maximum amount the State can claim is based on the expenses correctly paid by Medicaid on the homeowners behalf, but the amount cannot exceed the owners equity interest in the property. If the Medicaid claim amount is less than the equity interest, then any remaining equity is counted as an asset available to the recipient, who may no longer be eligible for Medicaid until these excess assets are depleted. Medicaid policies are designed to protect the homes of institutionalized recipients from the application of a TEFRA lien in certain circumstances. First, the State must afford the homeowner an opportunity for a hearing on the finding that institutionalization is permanent. Second, the State must discharge a TEFRA lien if the recipient returns home. Finally, TEFRA liens are prohibited if the home is lawfully occupied by the recipients spouse, child under 21, or blind or permanently disabled child of any age. They are also prohibited if the recipients sibling has lived in the home for at least 1 year and has an equity interest. In 1993, Congress passed the Omnibus Budget Reconciliation Act (OBRA 93), which required states to recover Medicaid long-term care expenses from the estates of persons who received Medicaid services after age 55 and those who, regardless of age, were determined by the State to be permanently institutionalized.20 Medicaids low financial eligibility thresholds make it highly unlikely for recipients to leave much of an estate when they die, the one exception being the homes of recipients who have managed to retain ownership. The home is clearly the most valuable single asset in estates potentially subject to Medicaid estate recovery. Estate recovery is prohibited -- and the home protected -- if the recipient is survived by a spouse, or a child under the age of 21 or blind or permanently disabled. These survivors are free to do with the home as they wish. The laws of some states (e.g., Florida and Texas)21 protect the decedents home by placing certain interests of survivors ahead of the claims of some or all creditors, including Medicaid. Other states place liens on homes occupied by surviving spouses of deceased Medicaid recipients. Like TEFRA liens on homes of living recipients, post-death liens on the home are filed with the local property office. While these liens cannot interfere with the spouses right to sell the property and use the proceeds as he or she wishes,22 they ensure that the State is notified of any attempt to transfer the property, and they protect the States right to recover from the homes equity at a later time if it becomes part of the spouses estate. Estate recovery is also prohibited in certain instances if a recipients sibling or adult child still lives in the home. Siblings must have an equity interest in the home and have lived there for at least 1 year immediately before the deceased Medicaid recipient was institutionalized. Adult children must have lived in the home for at least 2 years immediately before the deceased Medicaid recipient was institutionalized and have provided care that may have delayed the recipients admission to a nursing home or other medical institution.23 Hypothetically, states can initiate recovery if and when the sibling or adult child moves out of the home. Whether they do so in fact remains to be examined. Treatment of the home in Medicaid estate recovery programs is a controversial subject that pits the interests of Medicaid against those of recipients who own homes and their families. On the one side of the debate is the public interest argument: Medicaid is a catastrophic insurance program that provides medical assistance to individuals after all available private resources have been applied to the cost of care. Medicaid is chronically strapped for funds and it cannot fully achieve its primary purpose if it subsidizes health care for people who have sufficient means to pay for their own long-term care expenses. Consequently, when the home is no longer needed by the recipient or his or her spouse or dependent child, its equity should be treated like money in the bank and used to repay the Medicaid program. This allows -- but does not require -- states to use budget-limited Medicaid funds to improve benefits, cover more poor people in greater need, and avoid the worst case scenario -- denying necessary services to people in need through eligibility restrictions, prior authorization procedures and waiting lists. How states actually use funds that are freed up when recipients home equity is used to defray Medicaid long-term care spending has not been studied. On the other hand, the recipient-centered argument regards the home as an asset that should remain with the family, consistent with deeply held cultural values that regard the family homestead as a right and a legacy that public policy ought to protect. Families may attach a practical, emotional, and even mythical significance to their home, and sometimes view Medicaid claims against it as an attempt by the State to confiscate what rightfully belongs to the family. A Medicaid claim against home equity is regarded as a penalty for people who have accumulated enough wealth through hard work to own their own home. Having depleted all their other assets to qualify for Medicaid, should their home also be put at risk? Besides, the argument goes, inheritance and other laws protect the homestead against certain taxes and creditors. Is it fair to deprive Medicaid recipients and their survivors of similar protection simply because a family member was unlucky enough to need help paying for long-term care? Medicaid policies regarding the recipients home -- whether it is exempt from recovery or a countable asset -- are complex and controversial for several reasons. First, they have contradictory aims - both to protect the home when it is needed and "to assure that all of the resources available to an institutionalized individual, including equity in a home, which are not needed for the support of a spouse or dependent children, will be used to defray the cost of supporting the individual in the institution. "24 Second, it is up to each state to determine how the general principles laid out in Federal guidelines apply to specific cases. This results in different state practices that have different outcomes for people. Finally, the application of these rules, which is consistent with the role of Medicaid as payer of last resort, sometimes deprives families of their perceived right to inherit the recipients home, which is consistent with cultural values. Medicaid is authorized by Title XIX of the Social Security Act at: http://www.ssa.gov/OP_Home/ssact/title19/1900.htm. For a comprehensive overview of Medicaid, see Schneider, A. (July 2002). The Medicaid Resource Book. The Kaiser Commission on Medicaid and the Uninsured at: http://www.kff.org/medicaid/2236-index.cfm. Medicaid home exemption rules mirror those of the Supplemental Security Income (SSI) program, Title 20 of the Code of Federal Regulations, Section 416.1212. The home includes the dwelling in which the person lives, the land on which it is located, and related outbuildings. See: http://www.ssa.gov/OP_Home/cfr20/416/416-1212.htm. See the last paragraph of Section 3810 A.1. of the State Medicaid Manual at: http://www.cms.hhs.gov/manuals/45_smm/sm_03_3_3800_to_3812.asp#_3810. Eleven states are categorized as 209(b) States according to: Groups Deemed to be Receiving SSI for Medicaid Purposes. Technical Assistance Series for Medicaid Services to Elderly or People with Disabilities. Disabled and Elderly Health Programs Group. Center for Medicaid and State Operations. June 12, 2002. Disability and Aging TA Series #01 at: http://www.cms.hhs.gov/medicaid/eligibility/ssideem.pdf. Information from 21 states is provided in a report prepared for AARP/PPI by Charles P. Sabatino and Erica Wood, Medicaid Estate Recovery: A Survey of State Programs and Practices, September 1996, Table 8. Information from three additional states is provided in Chapter 5 of the study by the Ohio Department of Human Services, Medicaid Estate Planning and Estate Recovery in Ohio. August 1999 at: http://jfs.ohio.gov/ohp/bltcf/reports/er/ER_B.pdf. Medicaid rules determine the nursing home recipients share of cost by subtracting from total income certain amounts to be protected for designated personal uses, which may include a time-limited allowance for home maintenance expenses. The recipient is presumed to use the remainder to offset the cost of care, with Medicaid paying the difference. Regulations on the recipients post-eligibility share of cost can be found in Title 42 of the Code of Federal Regulations, Chapter 435, Subparts H and I available at: http://www.gpoaccess.gov/cfr/retrieve.html. Federal interpretive guidance is in the State Medicaid Manual, Chapter 3, Sections 3700-3714, 3628.2 and 3590, at: http://www.cms.hhs.gov/manuals/45_smm/sm_03_3_toc.asp. Federal guidance on uncompensated asset transfers can be found in Section 3257 and 3258 of the State Medicaid Manual at: http://www.cms.hhs.gov/manuals/45_smm/sm_03_3_3257_to_3259.8.asp#_3258. Collections data for all states, as reported on the CMS 64, are available at: http://www.cms.hhs.gov/medicaid/mbes/ofs-64.asp. An article in USA Today (4/20/2002) entitled: Medicaid patient dies. Who gets the house? quotes Roy Fredericks, director of Oregon's program: "If they want to retain the home in the family, we're willing to work with them." "What we can't do is just pretend that there isn't a claim. We have a public trust, and we have to pursue these assets." http://www.usatoday.com/news/nation/2002/05/01/usatcov-medicaid.htm#more. Fredericks, R., Oregon Department of Human Services. Personal communication. May 5, 2004. Oregons policies are also outlined in Medicaid: Recoveries From Nursing Home Recipients Estates Could Offset Program Cost. US General Accounting Office. GAO/HRD-89-56. March 1989. Federal guidance on annuities and life estates is in Section 3258.9 of the State Medicaid Manual at: http://www.cms.hhs.gov/manuals/45_smm/sm_03_3_3257_to_3259.8.asp#_3258.9. Well-respected national experts on these matters can offer little advice to beneficiaries and their families other than get a lawyer with local expertise. For example, see the questions and answers at: http://www.elderlawanswers.com/AskHarry/Forum.asp. Section 13612 of P.L. 103-66 imposed the Medicaid estate recovery mandate by amending Section Title XIX of the Social Security Act at: http://www.ssa.gov/OP_Home/ssact/title19/1917.htm. Detailed Federal guidance to states is in the State Medicaid Manual, Chapter 3, Section 3810 at: http://www.cms.hhs.gov/manuals/45_smm/sm_03_3_3800_to_3812.asp#_3810. Before TEFRA was enacted, a recipient could give away his or her home without affecting Medicaid eligibility. Subsequent statutory changes [section 303(b) of the Medicare Catastrophic Coverage Act of 1988] mandated eligibility penalties on such transfers. Section 13612 of P.L. 103-66 imposed the Medicaid estate recovery mandate by amending Title XIX of the Social Security Act, accessible at: http://www.ssa.gov/OP_Home/ssact/title19/1917.htm. Detailed Federal guidance to states is in the State Medicaid Manual, Chapter 3, Section 3810 at: http://www.cms.hhs.gov/manuals/45_smm/sm_03_3_3800_to_3812.asp#_3810. States must also recover from recipients on whose homes they have placed a TEFRA lien. States may also require a determination that the Medicaid recipient consented to this outcome so as to avoid conflicting claims by other possible heirs. United States Code, Congressional and Administrative News, 97th Congress--Second Session--1982, Legislative History [Public Laws 97-146 to 97-248] Volume 2. St. Paul, Minnesota. West Publishing Company. p. 814.